Near Miss: Gingered Peach Cobbler! | Delicious! Delicious! Near Miss: Gingered Peach Cobbler! The production is in full swing. The CREW hustles around, setting up the next shot. The Director chats with Mr. R. and Miss A. in the middle of the set. Caryn watches the action from a distance. ANGLE ON a GRIP walking toward Caryn with a long, metal pole directed straight for the back of her head. Caryn doesn’t budge. The grip doesn’t see her. …reaches out toward her. She is violently pulled to the side, nearly falling over. The grip passes with the pole. He scowls at her as he yells again. Caryn is stunned to see the grip speaking to her. A man whispers to her in a familiar voice. Points means to get out of his way. She looks over to discover that her employer also seems to be playing the role of her hero. He smiles at her as a parent to a child. Just try to act like you know what you’re doing here. You’re supposed to be my assistant, remember? Yes, sorry. I, um, just wanted to let you know that the cobbler is ready. Thanks. I’ll be done soon. She stares at a spot on her tennis shoe. He laughs again. Caryn steals a glance around at the crew that has suddenly fallen silent. The whole set is now waiting for them, watching Mr. R. and Caryn intently. She squirms under the stares, but he doesn’t seem to care. What kind of cobbler is it? Caryn catches Lauren’s disapproving eye. Ah! From a Georgia girl, of course. Mr. R. straightens his costume. Try to be more careful, Caryn. He gently pats her shoulder and then saunters back to set. The Director immediately starts yelling instructions to his crew in anticipation of the shot. Lauren redirects her focus to the monitor before her. And Caryn sneaks away, relieved to be out of the spotlight. It ain’t the prettiest cobbler, but the ginger jazzes up this Southern classic. The pastry crust is thicker than a pie crust which makes it more suitable for a cobbler. Use ready-made pie dough in a pinch. 1. To make dough: Combine flour, salt and shortening in food processor until even. Add butter in pieces, pulsating until mixture resembles coarse crumbs. Slowly add just enough ice water for dough to stick together (not necessary to use the whole 1/2 cup). Knead dough a few times and divide into two portions, one slightly larger. Wrap in plastic wrap and flatten slightly. Refrigerate at least 30 minutes. 2. Preheat oven to 400 degrees. Lightly grease a 13×9-inch pan. 3. Mix sugar and cornstarch in a large bowl. Add peaches, lemon juice and ginger. Toss to coat and set aside for 15 minutes. 4. Roll out larger portion of dough to a 15×12-inch rectangle, no thicker than 1/4″ inch. Place dough in prepared pan, wrapping dough up the sides of the pan. Pour peach mixture on top of dough. Trim dough just above peaches. 5. Roll out remaining dough into a rectangle about 1/4″ thick. 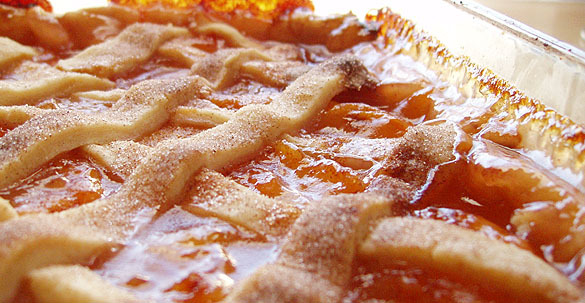 Cut into 1/4″-1/2″ strips and arrange in a lattice pattern over peaches (diagonally is easiest). Squeeze edges of strips with bottom dough to seal. Mix cinnamon and sugar together. Brush strips with egg white and sprinkle with cinnamon mixture. 6. Bake about 45 minutes until bubbly and crust is golden. Serve warm. YUMMMM, both the story and the cobbler! Getting juicy! Yeah!!! I can’t tell you how excited I get when someone tries a recipe. I also REALLY love pie, so I hope to be posting a few more options this summer. Thanks for sharing the feedback…you’ve made my day!